it becomes necessary for one People to dissolve the Political Bands which have connected them with another, and to assume among the Powers of the Earth, the separate and equal Station to which the Laws of Nature and of Nature’s God entitle them, a decent Respect to the Opinions of Mankind requires that they should declare the causes which impel them to the Separation. WE hold these Truths to be self-evident, that all Men are created equal, that they are endowed by their Creator with certain unalienable Rights, that among these are Life, Liberty and the Pursuit of Happiness — That to secure these Rights, Governments are instituted among Men, deriving their just Powers from the Consent of the Governed, that whenever any Form of Government becomes destructive of these Ends, it is the Right of the People to alter or to abolish it, and to institute new Government, laying its Foundation on such Principles, and organizing its Powers in such Form, as to them shall seem most likely to effect their Safety and Happiness. Prudence, indeed, will dictate that Governments long established should not be changed for light and transient Causes; and accordingly all Experience hath shewn, that Mankind are more disposed to suffer, while Evils are sufferable, than to right themselves by abolishing the Forms to which they are accustomed. But when a long Train of Abuses and Usurpations, pursuing invariably the same Object, evinces a Design to reduce them under absolute Despotism, it is their Right, it is their Duty, to throw off such Government, and to provide new Guards for their future Security. Such has been the patient Sufferance of these Colonies, and such is now the Necessity which constrains them to alter their former Systems of Government. The History of the present King of Great-Britain is a History of repeated Injuries and Usurpations, all having in direct Object the Establishment of an absolute Tyranny over these States. To prove this, let Facts be submitted to a candid World. HE has refused for a long Time, after such Dissolutions, to cause others to be elected, whereby the Legislative Powers, incapable of the Annihilation, have returned to the People at large for their exercise, the State remaining in the mean time exposed to all the Dangers of Invasion from without, and the Convulsions within. HE has endeavoured to prevent the Population of these States, for that Purpose obstructing the Laws for Naturalization of Foreigners, refusing to pass others to encourage their Migrations hither, and raising the Conditions of new Appropriations of Lands. NOR have we been wanting in Attentions to our Brittish Brethren. We have warned them from Time to Time of Attempts by their Legislature to extend an unwarrantable Jurisdiction over us. We have reminded them of the Circumstances of our Emigration and Settlement here. We have appealed to their native Justice and Magnanimity, and we have conjured them by the Ties of our common Kindred to disavow these Usurpations, which, would inevitably interrupt our Connections and Correspondence. They too have been deaf to the Voice of Justice and of Consanguinity. We must, therefore, acquiesce in the Necessity, which denounces our Separation, and hold them, as we hold the rest of Mankind, Enemies in War, in Peace, Friends. WE, therefore, the Representatives of the UNITED STATED OF AMERICA, in GENERAL CONGRESS, Assembled, appealing to the Supreme Judge of the World for the Rectitude of our Intentions, do, in the Name, and by Authority of the good People of these Colonies, solemnly Publish and Declare, That these United Colonies are, and of Right ought to be, FREE AND INDEPENDENT STATES, that they are absolved from all Allegiance to the British Crown,and that all political Connection between them and the state of Great-Britain, is and ought to be totally dissolved; and that as FREE AND INDEPENDENT STATES, they have full Power to levy War, conclude Peace, contract Alliances, establish Commerce, and to do all other Acts and Things which INDEPENDENT STATES may of right do. 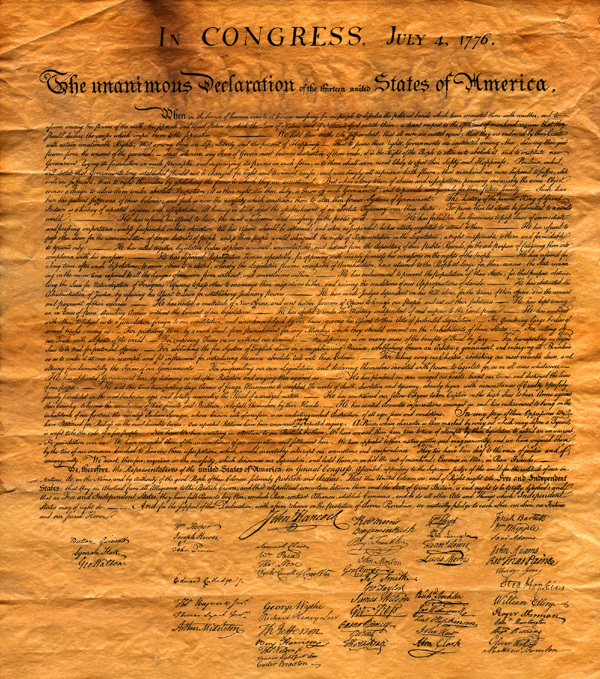 And for the support of this Declaration, with a firm Reliance on the Protection of divine Providence, we mutually pledge to each other our Lives, our Fortunes, and our sacred Honor. XIII. That a well regulated militia, composed of the body of the people, trained to arms, is the proper, natural, and safe defense of a free state; that standing armies, in time of peace, should be avoided as dangerous to liberty; and that, in all cases, the military should be under strict subordination to, and be governed by, the civilpower. XV. That no free government, or the blessings or liberty, can be preserved to any people but by a firm adherence to justice, moderation, temperance, frugality, and virtue and by frequent recurrence to fundamental principles. Red text that has been struck through (such as this) represents content removed during the draft. 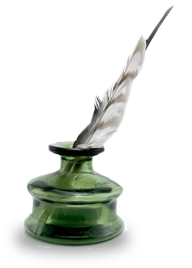 Text in italics represents content added during the draft, which appears in the final Declaration. are endowed by their Creator with inherent and certain inalienable rights; that among these are life, liberty and the pursuit of happiness; that to secure these rights, governments are instituted among men, deriving their just powers from the consent of the governed; that whenever any form of government becomes destructive of these ends, it is the right of the people to alter or to abolish it, and to institute new government, laying its foundation on such principles, and organising it’s powers in such form as to them shall seem most likely to effect their safety and happiness. prudence indeed will dictate that governments long established should not be changed for light & transient causes. and accordingly all experience hath shewn that mankind are more disposed to suffer, while evils are sufferable, than to right themselves by abolishing the forms to which they are accustomed. but when a long train of abuses and usurpations, begun at a distinguished period, & pursuing invariably the same object, evinces a design to reduce them under absolute despotism, it is their right, it is their duty, to throw off such government, & to provide new guards for their future security. such has been the patient sufferance of these colonies; & such is now the necessity which constrains them to expunge alter their former systems of government. the history of the present king of Great Britain. is a history of unremitting repeated injuries and usurpations, among which appears no solitary fact to contradict the uniform tenor of the rest: but all having have in direct object the establishment of an absolute tyranny over these states. to prove this let facts be submitted to a candid world, for the truth of which we pledge a faith yet unsullied by falsehood. suspended, he has utterly neglected utterly to attend to them. he has dissolved Representative houses repeatedly & continually, for opposing with manly firmness his invasions on the rights of the people. he has refused for a long time after such dissolutions to cause others to be elected whereby the legislative powers, incapable of the annihilation, have returned to the people at large for their exercise, the state remaining in the mean time exposed to all the dangers of invasion from without, & the convulsions within. he has endeavoured to prevent the population of these States; for that purpose obstructing the laws for naturalization of foreigners; refusing to pass others to encourage their migrations hither; & raising the conditions of new appropriations of lands. he has suffered obstructed the administration of justice totally to cease in some of these states; by refusing his assent to laws for establishing judiciary powers. he has made our judges dependent on his will alone, for the tenure of their offices, and the amount and paiment of their salaries. he has erected a multitude of new offices by a self assumed power; & sent hither swarms of officers to harrass our people, and eat out their substance. he has kept among us, in time of peace, standing armies and ships of war; without the consent of our legislatures. for abolishing the free system of English laws in a neighboring province, establishing therein an arbitrary government and enlarging it’s boundaries so as to render it at once an example & fit instrument for introducing the same absolute rule into these states. for suspending our own legislatures, & declaring themselves invested with power to legislate for us in all cases whatsoever. he has abdicated government here, withdrawing his governors, & by declaring us out of his allegiance and protection and waging war against us. he is at this time transporting large armies of foreign mercenaries, to compleat the works of death, desolation & tyranny, already begun with circumstances of cruelty & perfidy scarcely paralleled in the most barbarous ages, and totally unworthy the head of a civilized nation. he has endeavoured to bring on the inhabitants of our frontiers the merciless Indian savages, whose known rule of warfare is an undistinguished destruction of all ages, sexes & conditions of existence. he has incited treasonable insurrections of our fellow citizens, with the allurements of forfeiture & confiscation of property. he has constrained our fellow citizens others, taken captives on the high seas to bear arms against their country, to become the executioners of their friends & brethren, or to fall themselves by their hands. he has waged cruel war against human nature itself, violating it’s most sacred rights of life & liberty in the persons of a distant people, who never offended him, captivating and carrying them into slavery in another hemisphere, or to incur miserable death in their transportation thither, this piratical warfare, the opprobrium of infidel powers, is the warfare of the Christian king of Great Britain. determined to keep open a market where MEN should be bought & sold, he has prostituted his negative for suppressing every legislative attempt to prohibit or to restrain this excerable commerce; and that this assemblage of horrors might want no fact of distinguished die, he now is now exciting those very people to rise in arms among us, and to purchase that liberty of which he has deprived them, by murdering the people upon whom he also obtruded them; thus paying off former crimes committed against the liberties of one people, with crimes which he urges them to commit against the lives of another. In every stage of these oppressions, we have petitioned for redress in the most humble terms; our repeated petitions have been answered only by repeated injury. a prince, whose character is thus marked by every act which may define a tyrant, is unfit to be the ruler of a free people who mean to be free, future ages will scarce believe that the hardiness of one man adventured within the short compass of twelve years only, to build a foundation, so broad and undisguised, for tyranny over a people fostered and fixed in principles of freedom. them from time to time of attempts by their legislature to extend a an unwarrantable jurisdiction over us these our states. we have reminded them of the circumstances of our emigration and settlement here, no one of which could warrant so strange a pretension; that these were affected at the expense of our own blood and treasure; unassisted by the wealth or the strength of Great Britain; that in constituting indeed our several forms of government, we had adopted on common king; thereby laying a foundation for perpetual league and amity with them; but that submission to their parliament was no part of our constitution, or ever in idea, if history may be credited; and we have appealed to their native justice and magnanimity, as well as to and we have conjured them by the tyes of our common kindred, to disavow these usurpations, which were likely to would inevitably interrupt our connections & correspondence. they too have been deaf to the voice of justice and of consanguinity; and when occasions have been given them, by the regular course of their laws, of removing from their councils the disturbers of our harmony, they have by their free election re-established them in power, at this very time too, they are permitting their chief magistrate to send over not only soldiers of our common blood, but Scotch and foreign mercenaries to invade and destroy us. these facts have given the last stab to agonizing affection; and manly spirit bids us to renouce forever these unfeeling brethren. we must therefore endeavor to forget our former love for them, and to hold them, as we hold the rest of mankind, enemies in war, in peace friends, we might have been a free & great people together; but a communication of grandeur and of freedom. it seems, is below dignity, be it so, since they will have it, the road to happiness and to glory is open to us too; we will climb it apart from them and acquiesce in the necessity which denounces our eternal separation and hold them, as we hold the rest of mankind, enemies in war, in peace friends. We therefore the Representatives of the United states of America, in General Congress assembled, appealing to the supreme judge of the world for the rectitude of our intentions, do, in the name and by authority of the good people of these states, reject colonies, solemnly publish and declare, that these united colonies are and of right ought to be free and independent states; that they are absolved from all allegiance to the British Crown, and that and renounce all allegiance and subjection to the kings of Great Britain, & all others who may hereafter claim by, through, or under them; we utterly dissolve all political connection which may heretofore have subsisted between us them and the state parliament or people of Great Britain; is & ought to be totally dissolved; and finally we do asssert [and declare] these colonies to be free and independant states, that as free & independant states, they have full power to levy war, conclude peace, contract alliances, establish commerce, & to do all other acts and things which independant states may of right do. 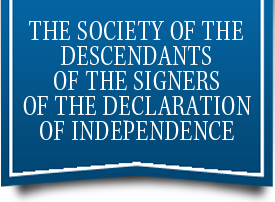 And for the support of this declaration, with firm reliance on the protection of divine providence, we mutually pledge to each other our lives, our fortunes, and our sacred honor.